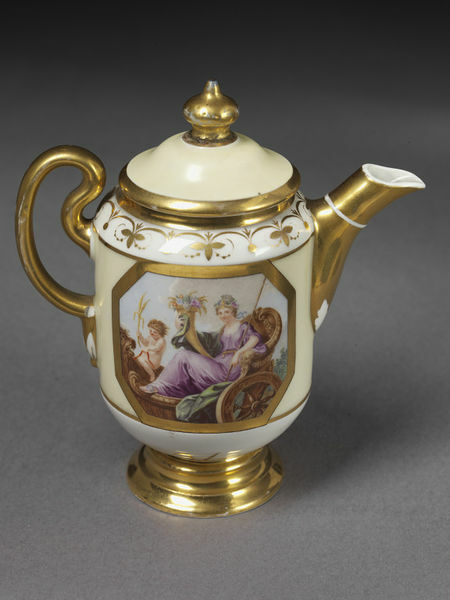 Cream jug and cover of hard-paste porcelain. Of cylindrical form, rounded above and below and rising from a small stepped pedestal foot; with domed cover and finial knob. High loop-handle shaped like an ear, with pendant; tapered spout. 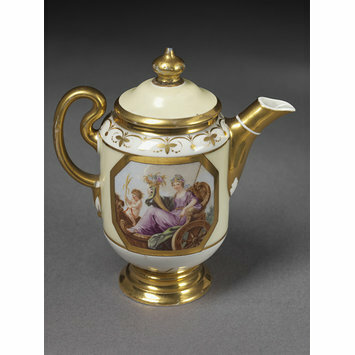 Lemon-yellow ground on the cover and in a band round the body, set in which on either side are two gilt-framed octagonal panels, with paintings representing Ceres in a chariot, and the Triumph of Galatea. The foot, handle, spout and knob are gilt. Hofmann, Friedrich Hermann, Geschichte der bayerischen Porzellan-manufaktur, Nymphenburg. Leipzig, K. W. Hiersemann, 1923, Abb. 418.